is the perfect venue for your celebration. Our Royal Gatherings give you the chance to let your hair down in beautiful surroundings, enjoy a relaxing spa treatment and take advantage of our stunning Champagne bar! You can hire an area of the salon exclusively for your party to enjoy, and with our fantastic packages at incredible prices, there’s something for everyone to enjoy. So gather your friends and let us do all the work! Please note: Our Royal Gatherings are for a minimum of four people. Make your party extra special with our beautiful gift hampers, packed with gorgeous gifts! 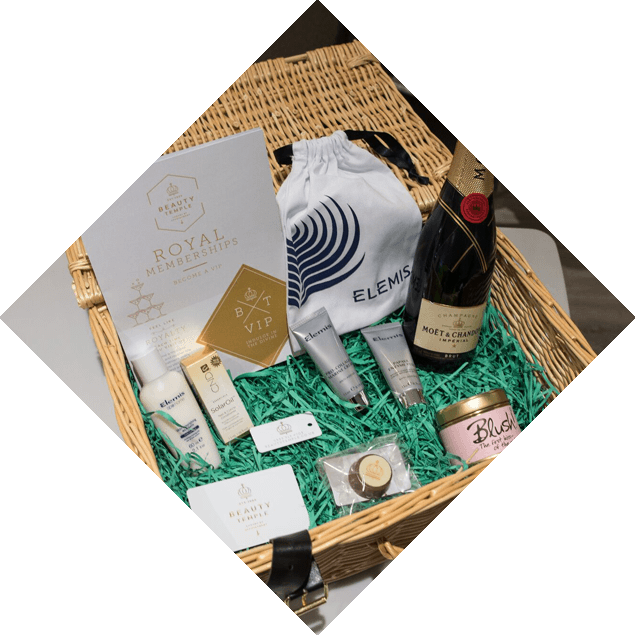 Whether its a baby shower, hen party treats or a birthday present they won’t forget, each hamper is tailored to your party and individual to you. Hampers start at £25 and are available to order when you book your bash. Let us treat you and your friends like Royalty! Create your own bespoke Royal party, where you choose the treatments and treats, while we take care of the pampering! If you’re in need of a treat why not combine both package A and B for only £10 more per person. You know you deserve it! (Please note: If you choose both packages you will still receive a single class of Prosecco per person, but we will offer you an additional 20% off additional drinks from the menu). For a laid-back get-together, enjoy a selection of pizzas and half a bottle of prosecco per person, plus one 25 minute treatment! Choose either our Royal Back Massage or Express facial, then head over to our Champagne nail bar for a Paint Pot polish to fingers or toes (upgrade to gel for £5). Celebrate in style! Ideal for a pre-celebration treat, wedding preparation or special morning. Includes your choice of a Royal Manicure or Pedicure, your choice of a cheeky add on (ask a member of staff for details), a light breakfast served in a picnic basket and a chilled glass of bubbly. Available between 8am - 11am. Come and celebrate the expected Prince or Princess at Beauty Temple! Enjoy celebratory cakes and a glass of bubbly (and a special mocktail for the mummy to be), or relax with tea and let us take care of you all. Mummy to be will enjoy any of the treatments listed above tailored to her needs. Enjoy a glass of prosecco and some delicious chips and dips to nibble on.